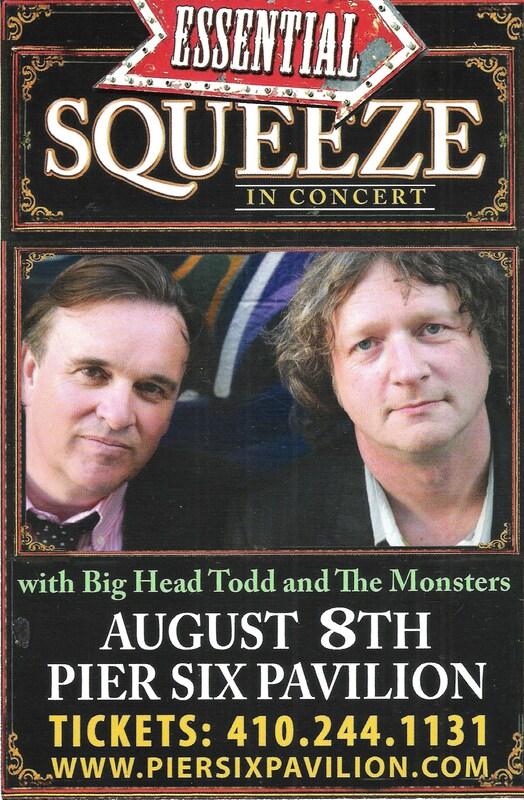 4 Responses to "Squeeze – 8 August 2007 – live at Pier Six Concert Pavilion Baltimore MD"
The problem with this particular show was that it was an outdoor show on what was probably the hottest day of the year in Baltimore. Oppressive heat and humidity. Big Head Todd & The Monsters opening set dragged on and on, as if they thought they were doing the headline set, then Squeeze’s set seemed over in a flash, as if they wanted to get out of the heat. The whole band came out wearing their customary suit jackets, and nobody took them off for the entire show, so I don’t wonder why they would want to do the short set. Still, despite the heat, the band played well, and it was good to see them on our shores for the first time in several years. I remember it well…the hottest, most humid day of the year in Baltimore. The whole band dressed in suits and jackets, which they didn’t take off for the entire set. Squeeze seemed to do an abbreviated show because of the heat. Meanwhile, the opener Big Head Todd & The Monsters’ set seemed like it would never end. What I said…still had a great time. I’ve often wondered if any tracks on “Five Live” came from this show?